Birds of a feather? : Former New York Mayor Rudolph Giuliani (C) with his Knighthood of the British Empire (KBE) medal and Former New York Police Commissioner Bernard Kerik with his Commander of the British Empire (CBE) medals, pose for a photograph at Buckingham Palace February 13, 2002 in London. 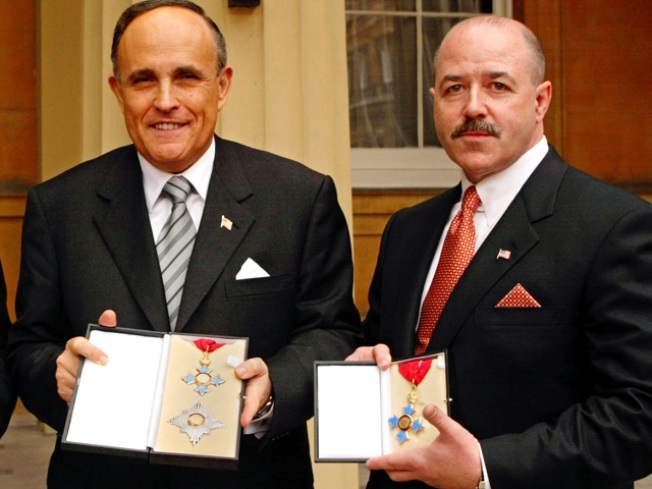 Giuliani received his Honorary Knight Commander of the Order of the British Empire from Queen Elizabeth ll in recognition of his leadership following the September 11 attacks on New York. Former Police Commissioner Bernard Kerik has been sentenced to four years in federal prison for tax fraud and lying to the White House. Former Mayor Rudolph Giuliani is not accused of any offense but, in a political sense, he is guilty of major wrongdoing. Giuliani is the man who plucked Kerik out of obscurity and promoted him from job to job as Kerik rose like a meteor from chauffeur and bodyguard to Correction Commissioner and, ultimately, the man our former mayor recommended to President Bush to be Homeland Security Secretary. The relationship between Kerik and Giuliani is hard to fathom. How could the man hailed as "America’s Mayor", the man who led the city in the aftermath of 9/11, have selected Bernard Kerik for all these challenging jobs? Obviously, Giuliani, once the racket-busting, corruption fighting prosecutor of New York, revised his standards. Political cronyism, in his book, was no longer a no-no. He prized loyalty above all else in his personal and professional relationships. Writer Michael Duffy recounted in Time magazine in 2007 that, on the evening when Mayor Giuliani summoned Kerik to tell him he was appointing him to a high-level job in the Correction Department, Kerik entered a dark room where members of the Mayor’s top staff were sitting. In the dimly lighted room Giuliani’s closest staff members, Kerik recalled, "came forward and kissed me." Kerik has said both he and Giuliani were big fans of "The Godfather" and he wondered if the Mayor "noticed how much becoming part of his team resembled becoming part of a Mafia family. I was being made. I was now part of the Giuliani family, getting the endorsement of the other family members, the other capos." So Kerik wrote in his autobiography. At yesterday’s sentencing of Kerik, Judge Stephen Robinson gave the former commissioner a longer sentence than expected -- four years -- for betraying a public trust, adding: "I think the damage caused by Mr. Kerik is in some ways immeasurable." As for Giuliani’s part in Kerik’s career, Douglas Muzzio, political science professor at Baruch College, told me, "Giuliani and Kerik are inextricably intertwined." "But Kerik has been a Giuliani campaign killer -- when the former Mayor ran for President and when he was considering a run for the Senate," said Muzzio. "There were other factors that prompted him not to run, but the Kerik factor was strong. He couldn’t escape it." In Muzzio’s view, Giuliani’s political enemies have images of the two at Ground Zero and other photographs that they could use to link the two men and this could discourage any Giuliani ambition for elected office. The mystery is: what did Rudy Giuliani see in Bernard Kerik that made him promote his governmental career? Giuliani not only favored his former bodyguard in government -- he made him a partner in his private business venture, Giuliani Partners, which has done security and emergency consulting work for private firms and governments around the world. The former Mayor has made a fortune on his presumed expertise in the security field. Thousands perished on 9/11 but Giuliani, on his presumed ability to advise people on terror, prospered. While other old friends and colleagues of Kerik appeared at his sentencing, Rudy Giuliani was absent. The loyalty he apparently prizes is not a two-way street. It goes up. But not down.